Set your hope fully on the grace that will be brought to you at the revelation of Jesus Christ—Put your hope in God, for I will yet praise him, my Savior and my God. We do not want you to become lazy, but to imitate those who through faith and patience inherit what has been promised…we who have fled to take hold of the hope set before us may be greatly encouraged. 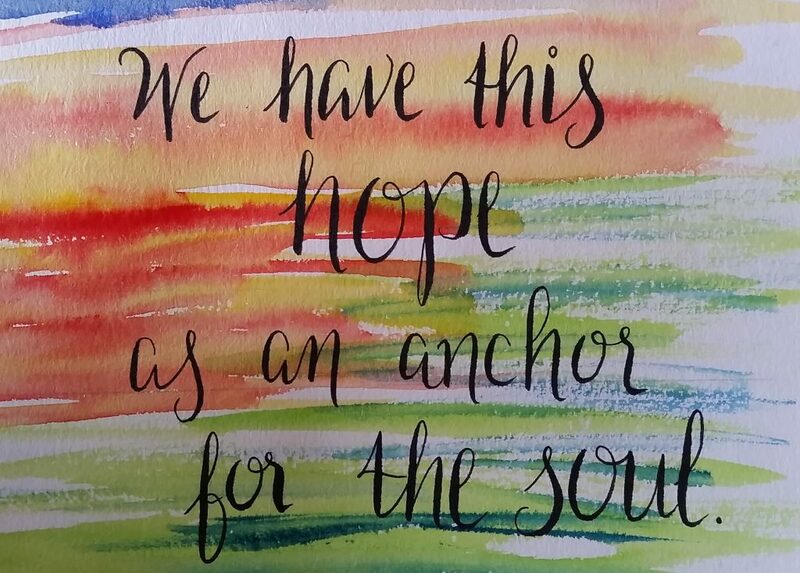 We have this hope as an anchor for the soul, firm and secure. Jesus Christ is the same yesterday and today and forever. Do not be led away by diverse and strange teachings, for it is good for the heart to be strengthened by grace—This is the true grace of God. Stand firm in it. How are you finishing this sentence these days? What do you want to see happen? What are you hoping for? I’ve been arrested in my study of Peter’s first letter by his admonition to “set your hope fully“ on a grace that is yet to come, when we see Jesus in all His glory. Other hopes rise and fall, often crushed by disappointment. But the hope of His coming to redeem all that is broken, to right all that is wrong and to make us truly holy, THIS is a hope that will not disappoint! This is where our hearts can safely rest. In the meantime life throws up obstacles, disappointments, and troubles galore which we will navigate best when we realize that the true grace of God isn’t one that exempts us from trials or makes them magically disappear. True grace accompanies us through them with the assurance that all will be well in the end. God’s Spirit joins us on the journey enabling us to live in such a way that God’s great goodness is seen shining in our wake. He turns our troubles into exhibits for His glory. This is the true grace of God. Stand firm in it. Thanks for this, Linda. I’ve been doing some poking around myself in biblical words about “hope,” and I’m going back now to re-read yours here. It’s great when God provides insight, unplanned, for the pen (keyboard?) of a friend! Wonderful, Michele. This is a theme much on my mind of late.